Research has shown that light therapy for acne may not be as promising as first thought. We’ll explain how it’s believed to work and why the research shows conflicting results. Our take on all the research we’ve seen, in particular a very insightful recent large-scale review: Whether done at home or in a doctor’s office, light therapy for acne isn’t preferred to most other acne treatments. This includes over-the-counter acne skin care as well as prescription options your dermatologist can provide. Whether done at home or in a dermatologist’s office, there are two types of light used on breakouts: blue light and red light. 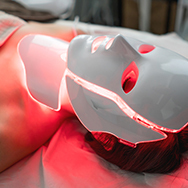 Both are believed to target specific acne triggers, using these machines that deliver these two different colours and intensities of light-emitting diodes, or LEDs. When use with a medication applied to the skin, treating acne with light is also known as photodynamic therapy (PDT). Unlike some light-emitting treatments, LED light therapy for acne can be done no matter your skin colour; however, as stated above, it really isn’t as successful or worth the extra money and time it takes versus conventional acne treatments with mounds of research establishing their benefit. The specific wavelength of blue LED light emitted by at-home or in-office devices seems to kill a major trigger of acne pimples while calming skin at the same time. There’s also research showing it can diminish oily skin. While that’s encouraging, the downside is that blue light presents some amount of risk to skin that shouldn’t be ignored: Routine exposure can be damaging to overall skin health and promote signs of ageing. Of course, taking steps to protect skin twice daily with an antioxidant-rich skin care routine can help. As an aside, the amount of blue light exposure we get from daily use of smart phones (unless you take steps to reduce this light; find out how here) presents a greater risk to skin than occasional short-term blue light treatments for acne. Red light for acne also uses LED technology, but it’s believed to work on a different acne trigger, skin’s overproduction of oil. For many who have acne, their oil contains inflammatory substances that pave the way for acne to pop up on the surface. It seems that red light therapy helps reduce the activity of inflammatory substances, and in doing so calms factors that help trigger acne. In essence, red light reduces the redness from acne. There’s a decent amount of research on both blue and red light therapy for acne, using different devices, intensities, and treatment protocols. Some studies compare results from light therapy to using over-the-counter skin care for acne or a combination. The problem? Many of these studies were poorly done, had only a small number of participants, or didn’t track long-term results to see if improvements continued. Other studies showed that light therapy used with an anti-acne skin care routine produced better results than skin care alone; in contrast, there are also studies showing the opposite result! How confusing and frustrating! Is Light Therapy for Acne Worth the Cost? Even if you still want to give these treatments a go, acne light therapy at home isn’t cheap. Expect to pay $150–$600 depending on the brand and type of device you choose. Devices that cost less than this aren’t likely to be strong enough to produce results—and results from the stronger devices might be so minor you’ll conclude they’re not worth your time and money. Speaking of time, a typical at-home device must be used at least once daily for several minutes at a time. That can become tedious, especially when using handheld devices, and then you still need to do your regular skin care routine and consider that results from all this time are likely to be minor at best. What About Acne Light Treatments from a Dermatologist? Acne light treatment from a dermatologist (which generally include applying a medication to the skin to enhance results) are only worth considering when all other acne treatments have failed. The research on long-term benefits simply isn’t there. Even if you see some relief after a few in-office treatments, light therapy isn’t likely to keep your acne under control for the long term; however, daily use of an anti-acne skin care routine can do this. Some dermatologists reserve light therapy for only for those with stubborn to severe acne, in which a multi-faceted approach can be your best option to get it under control. In these cases, the extra nudge light therapy may provide can be worth a try. An important difference between light therapy for acne at home and in a dermatologist’s office is that a doctor can fine-tune the results. As we mentioned dermatologists also have access to topical medications that are applied prior to the treatment and then left on during the exposure to light; these are believed to be more effective for resistant acne, particularly when used with red light. Not surprisingly, in-office light treatments for acne are more expensive than at-home devices. But the truth in beauty isn’t so pretty this time: Whether done at home or in a medical setting, LED treatments for acne aren’t as impressive as we once hoped.